Put data tables at your users’ fingertips with Infragistics' ASP.NET Data Grid. Edit, sort, move, filter, and template tabular data. Features touch-friendly styling and support for flicking and multi-touch gestures. Infragistics Web Data Grid for ASP.NET -Put data tables at your users’ fingertips with the high performance, scalable ASP.NET AJAX data grid. 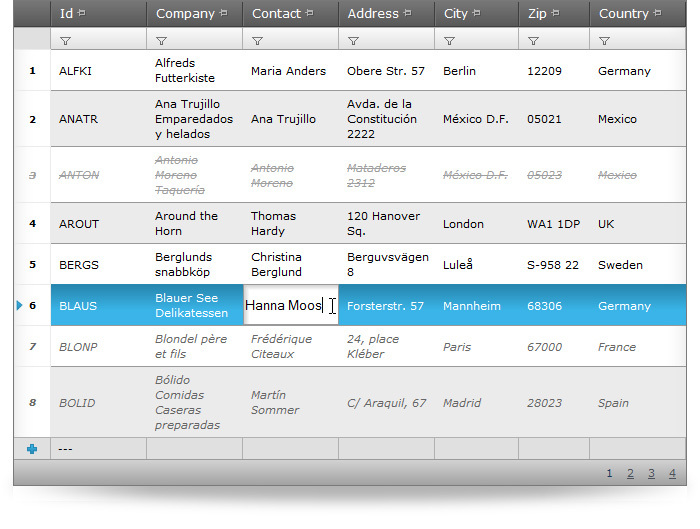 Rapidly display and edit flat, tabular information with rich features to sort, move, filter and template your data. The control features Touch friendly styling and support for flicking and multi-touch gestures on mobile devices. Excel-style Filtering extends the filtering capabilities of the grid and gives you the ability to file by unique values and set up custom filters for columns. 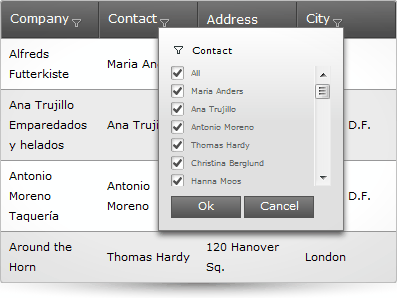 Use Multi-Column Footers to customize the footer area and display labels. This feature is a perfect complement to the column summary feature of the Grid. When you need flexibility to showcase your information, two features are better than one. We've combined the Multi-Column Headers with Column Fixing, so you can create multi-level headers, while moving, fixing and resizing columns on the left or right. Retain user updates within the grid’s temporary storage on the client-side until the user is ready to commit it to the data store.